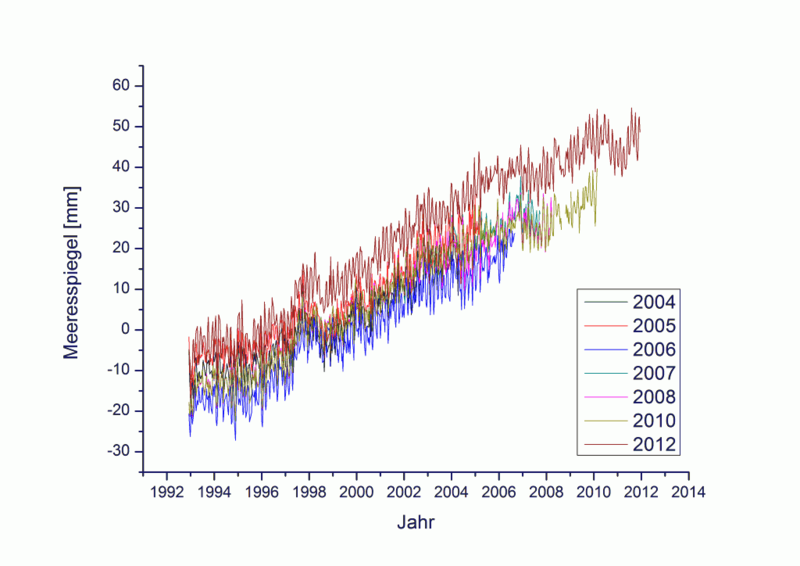 The German Skeptical Science site has analyzed satellite sea level altimetry data using the WayBackMachine archive and finds that "adjustments" have been made continuously over the past 8 years "all in one direction, namely towards an increasing sea level rise. It almost seems that in recent years the data has been "adjusted" to continue to keep the overall increase over the magical minimum of 3 millimeters per year." The analysis notes 7 other publications have found global sea level rise from tide gauges to be significantly less, from 1.2 to 1.9 mm/yr, and mentions the Holgate 2007 paper which found sea level rise decelerated over the 20th century. "because the Internet never forgets, useful sites such as the WayBackMachine [provide the history of data adjustments back to 2004]. 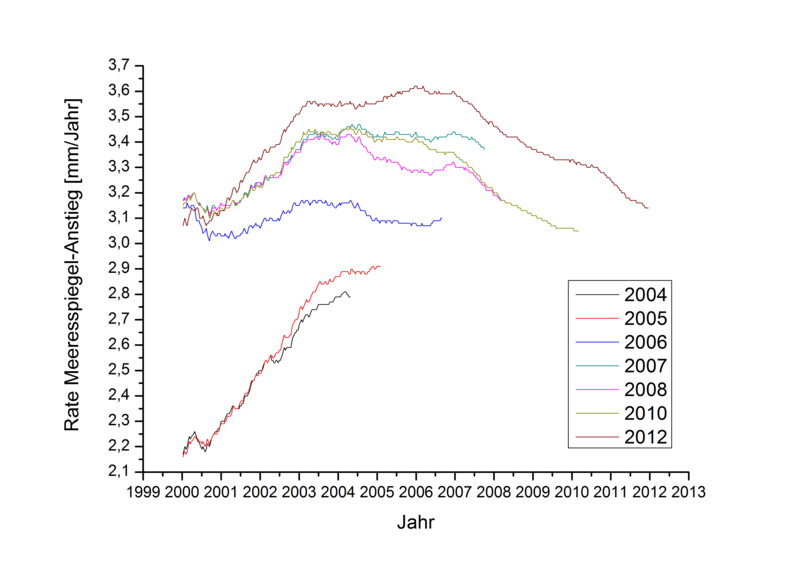 The data for the years 2004 to 2012 are shown for comparison in the following graphic. It can be seen at first glance that adjustments to the data were made continuously. The interesting thing is that these adjustments have all been in one direction, namely towards an increasing sea level rise. It almost seems that in recent years the data has been "adjusted" to continue to keep the overall increase over the magical minimum of three millimeters per year. The whole thing becomes even clearer if the resultant slope for the different data versions is presented graphically. Over the years can thus establish a "gradual" process of ever-new adjustments and corrections. We can therefore state that the raw data of sea level measurements show a rather flat course with an increase in the range of 0.5 to 1 millimeter per year. Only through a number of corrections that are based on assumptions which do not continue to increase does the "official" value become 3.1 mm per year. Although this figure may well make one wonder. If you look at the available level data looks from around the world (Permanent Service for Mean Sea Level PSMSL , here is a list of NOAA, with stops longer measurement history and the related trends ), you have difficulty to find at all stations where a similarly high value is found for sea level rise. Now, however, should the value measured by the satellite when it is it useful to represent a first approximation, the average of the global monitoring stations. The attempt to establish such an average has been so far by different authors using different methodologies undertaken.The values ​​found are all moving in the range of 1-2 mm per year rise (10-20 cm in 100 years). None of the authors looked even close to values ​​that the 3.1 mm / year of the satellite data. The following table provides an overview of various papers. One might assume that the rise in sea level in the 20th Century has just accelerated (which was also suggested by IPCC-related authors ). An (albeit small) acceleration has been in the works of Church et al. (2006 and 2011 ). However, the authors themselves, admit that other authors had previously not seen such an acceleration ("no 20th century acceleration has previously been detected"). It is interesting to mention that Holgate ( 2007) has found just the opposite, namely, that the increase in 1904-1953 of 2.03 mm per year was greater than in the period 1954-2003 of 1.45 mm per year. It might be worth mentioning the particular satellites involved. In this particular case, they seem to be referring to Envisat, and Jason I..... the reason why I bring this up, is that Jason II is also in the process of being adjusted. Sea level rises around the UK show no accelerating trend, and the rate after allowing for isostatic change comes back to that magical figure of about 7" per century. And why has this been done? Obvious! To sustain the fraud of catastrophic man-made global warming i.e. the great global warming swindle. It is time the fraudsters were put in jail!